A lower control arm is designed to act as a support between the car frame and the spindle which is where the tire is located. Every car is designed with control arms no matter if it is conventional, hybrid or electric. At least 2 control arms are on any car while independent rear suspension models will have at least four. These arms consist of two rubber bushings a metal frame and in some cases a ball joint. 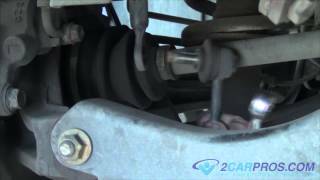 Responsible for allowing the wheel to move upward while the car hits at bump without transferring the motion to the body of the car a control arm acts like a hinge which supports the weight of the car by using a spring and shock assembly. Because the weight of the car is transferred through the control arm two rubber bushings are fitted at the pivot point and bolted to the frame. 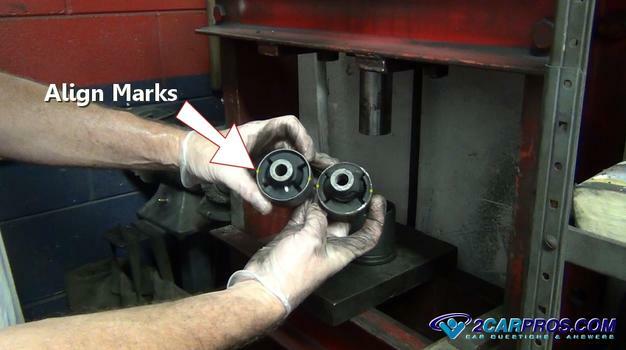 Road conditions and driving habits can contribute to the wear of these bushings which will become worn and fall apart. These bushing can be inspected by raising the car up and looking for an irregular configuration of the rubber center of the bushing. Many control arms have the ball joint manufactured into the arm which will be replaced along with the control arm itself. When one control arm is worn it is highly advised to replace the opposing arm. 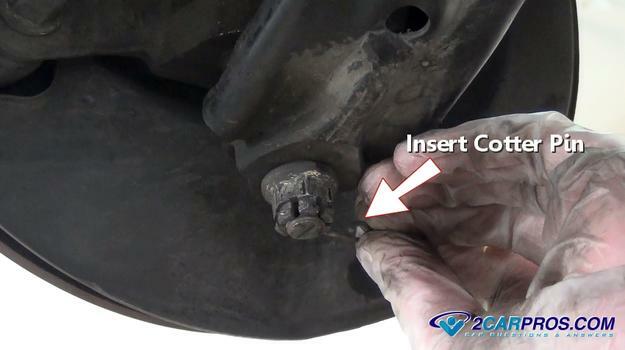 If you were to take your car into a repair garage or the dealer to have a control arm replaced parts and labor would cost you between $280.00 and $350.00 (US) per side depending on the manufacturer. If you are replacing the arm yourself you can get an replacement arm from Amazon or the local parts store for between $44.00 and $95.00 (US) each. In this guide we show how you can not only replace the arm but replace the bushing in the arm which will save even more because the bushing only costs between $9.00 and $14.00 (US). You will need to start by removing the wheel and jacking the car up while supporting it on jack stands. Also wear protective eyewear and gloves. To start the ball joint must be released which can be done using a large wrench 20mm to 24mm or socket and loosening the ball joint nut after the cotter pin has been removed. Then by using a hammer strike the spindle or control arm bulkhead to "shock" the taper fit loose. 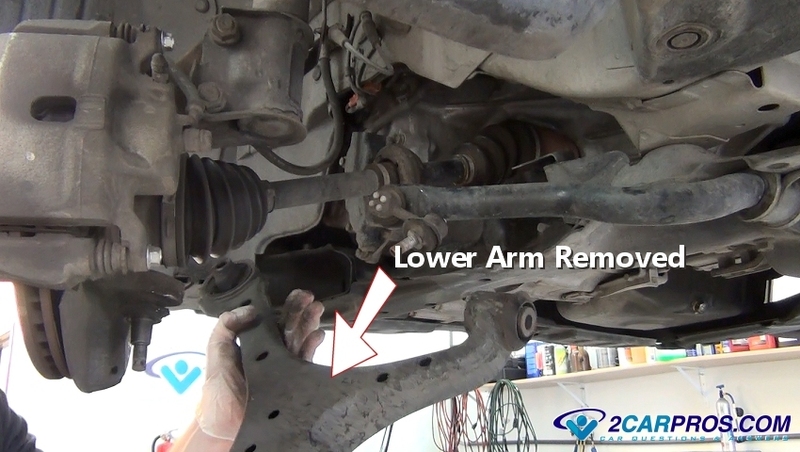 If this job is being done on "live spring" suspension (shock) the lower control arm must be held by a hydraulic jack and then slowly lowered once the ball joint is released. 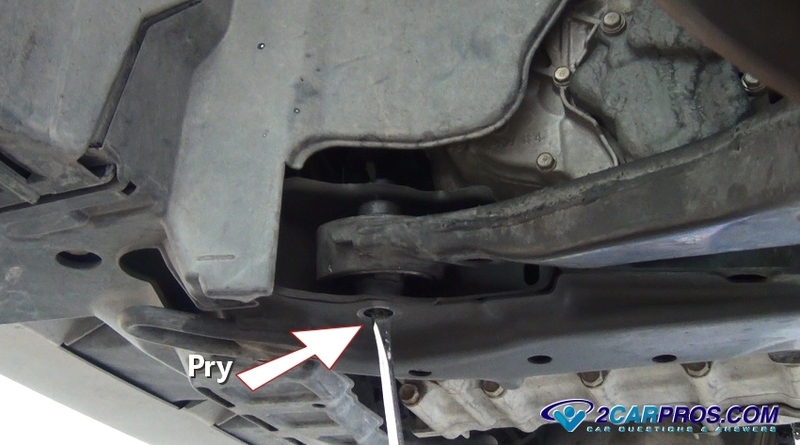 A sway bar will be connected to the control arm by way of the sway bar link. 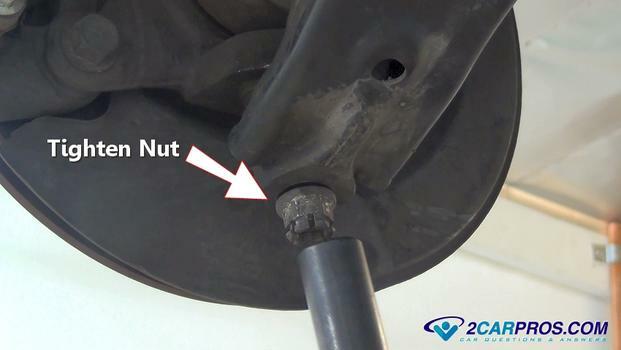 Remove the nut using a 14mm or 15mm wrench or socket. 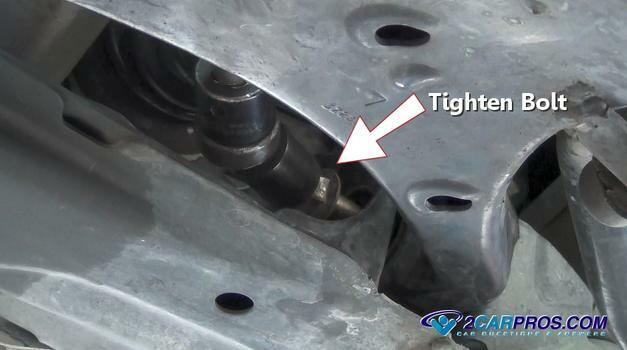 There could be a mini taper fit for this connection so you may need to shock it loose much like the ball joint. 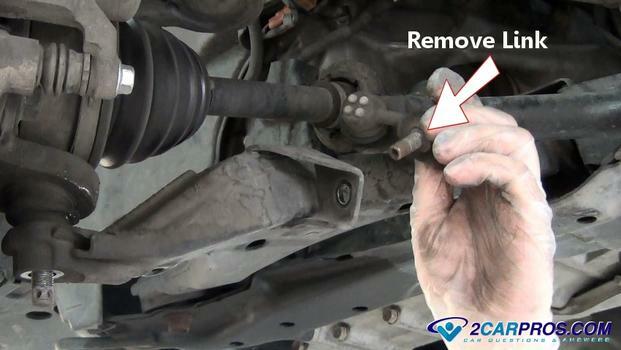 Grasp the sway bar link and remove it away from the lower control arm mount. 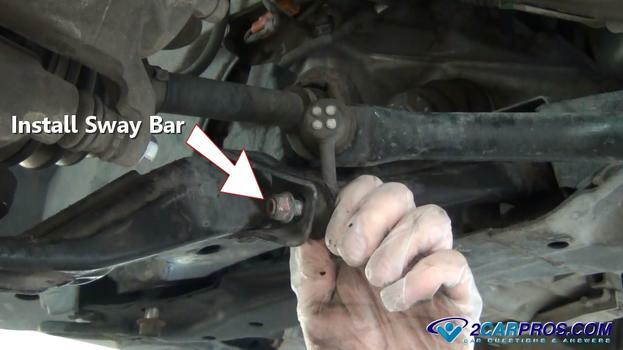 This will help the sway bar link stay out of the way during the job. There will be two control arm mounting bolts which could be horizontal or vertical. 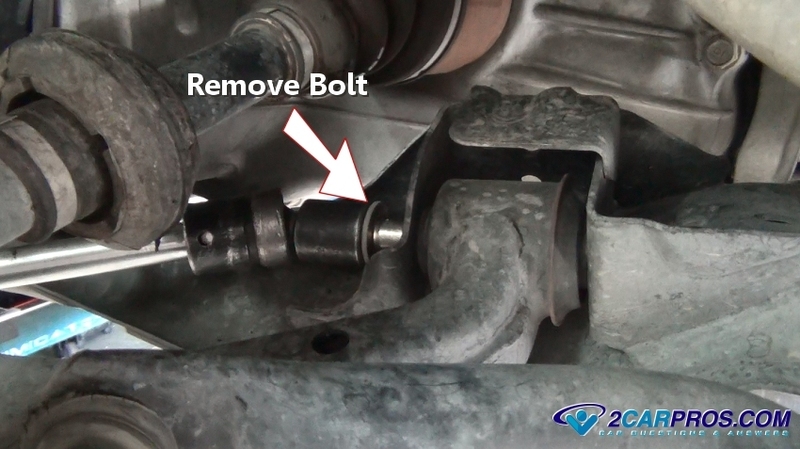 Use a 19mm to 22mm wrench or socket to loosen and remove the bolts. Some bolts will have a nut on the backside which will need to held by an additional wrench. 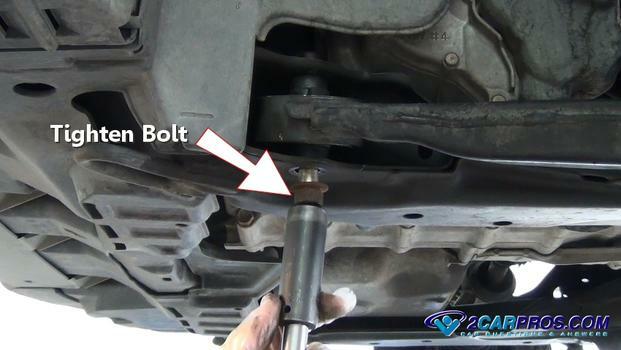 These bolts will be tight so make sure the socket or wrench is securely on the head of the bolt to avoid rounding. 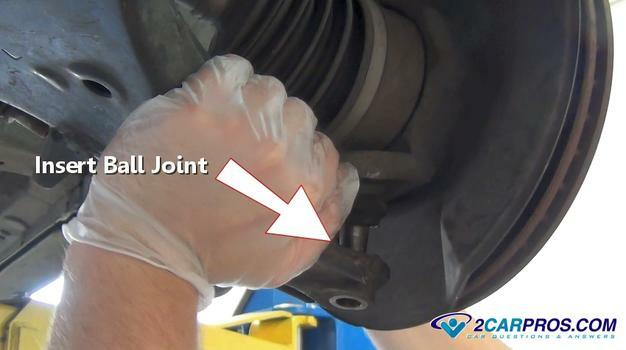 A universal joint and socket can be used to remove the rear control arm bolt which makes the job easier. After the bolts have been removed the arm may be loose so keep your hands on it. If the control arm is still in its mounts firmly grasp the arm and pull it outward while moving it up and down to remove it from the frame mounts. If you are replacing just the bushings then continue with this guide. 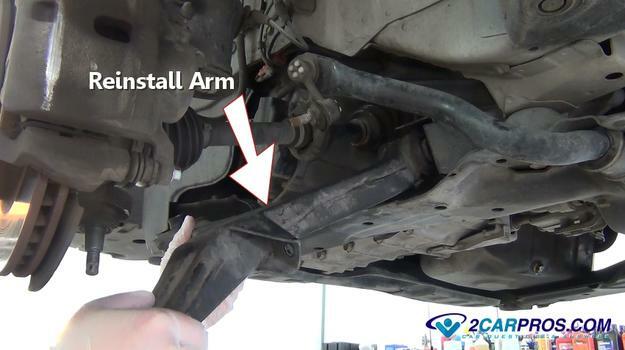 If you are replacing the entire control arm then continue onto number 6 in this guide. 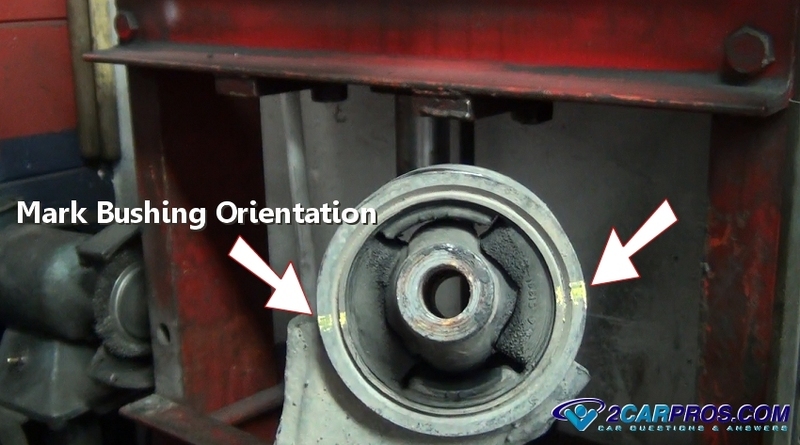 In the image below you can see the old bushing is torn allowing the control arm to wonder around in its mounts which causes brake pull and irregular tire wear. Match the new bushing to the old bashing located in the control arm. It should be an identical match. A press will be needed to remove the old bushings and install the new unit. First mark the orientation to ensure the new bushing will be installed correctly. 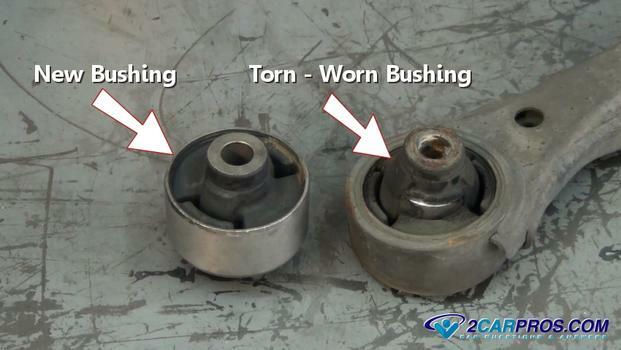 If the bushing is incorrectly installed it will tear while incorrectly performing. Look at the bushing so the flex part of the bushing is in the same location as the original. 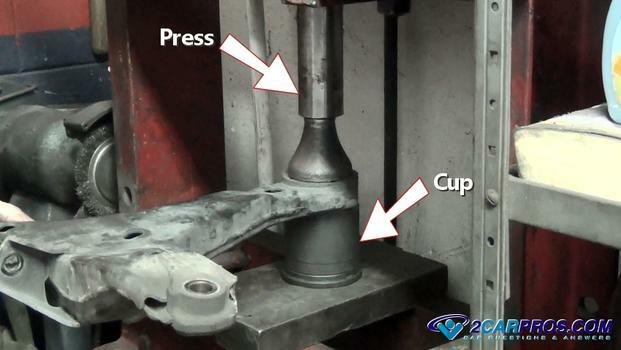 Position the lower control arm into a hydraulic press using a press cone and cup to force the bushing from the arm. There will be an audible "pop" when the bushing starts to move. 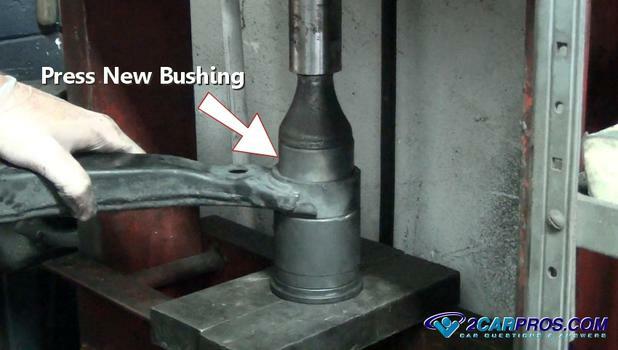 Continue pressing the bushing until fully it is removed from the arm. The control arm will become loose when the operation is complete. Then you can release the press and remove the arm. Here we show the correct orientation of the bushing which will be installed in the same way as the old bushing. Place the new bushing into the lower control arm while observing the marks you made from the old bushing. Do not apply lubrication to the bushing case because it will allow the bushing to walk its way out of the arm while in use. Align the press and slowly force the new bushing into place. 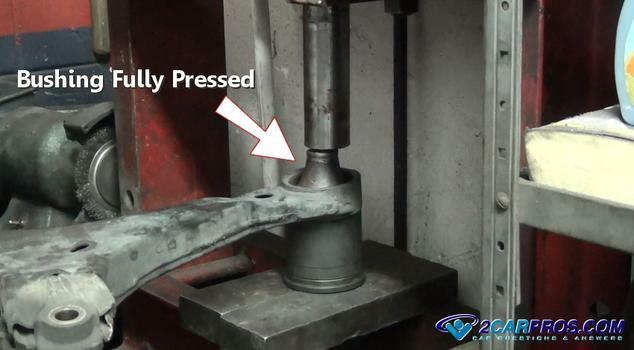 Make sure the bushing stays straight during the initial press so it does not distort the housing. Once the press has begun the bushing will stay straight. 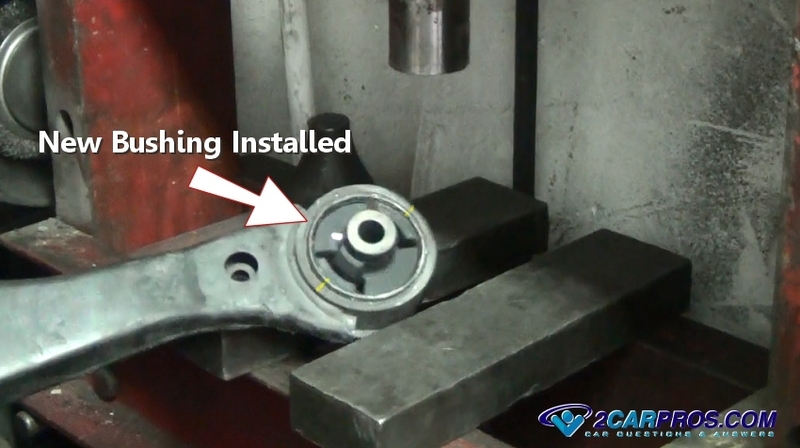 Confirm the full installation of the new bushing and repeat this procedure for the opposing unit. One complete the control arm is ready to be reinstalled. 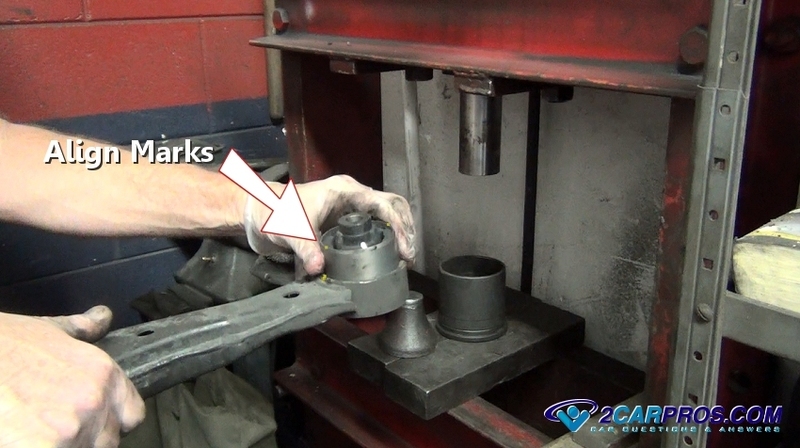 While grasping the new or rebuilt lower control arm wedge the bushing into the fame mounts. This might take a little doing which an up and down motion will help with while pushing inward on the control arm. As you are installing the arm watch the bolts holes so you can align them to help get the bolts back into the holes. You can use a screwdriver to help you perform this action which is demonstrated in the image below. Once aligned insert the control arm mounting bolts by hand to avoid cross threading. 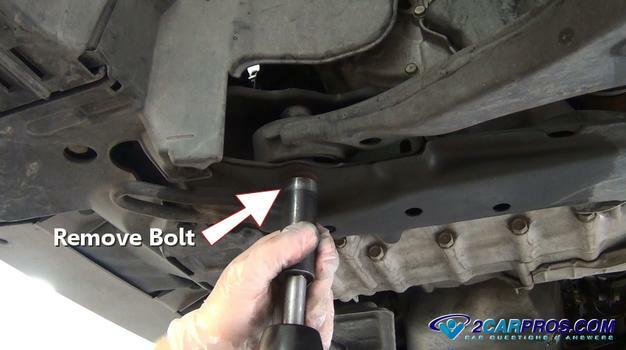 Do not tighten the bolts until all bolts including the ball joint is started. 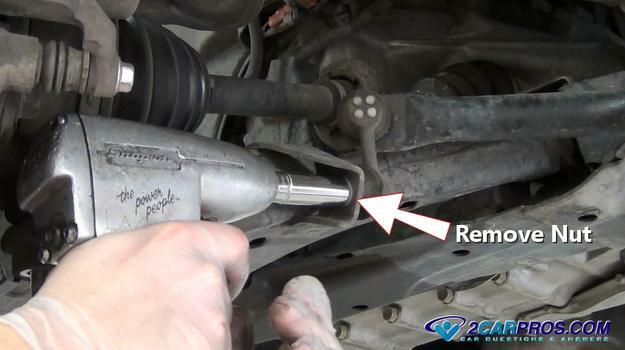 Position the lower ball joint and insert it into the control arm and install the nut by hand. Insert the sway bar link into the control arm and reinstall the sway bar link and nut. After all bolts and nuts have been installed tighten the front arm mounting bolt. Tighten these bolts to manufactures torque specification which usually between 65 and 75 foot pounds. 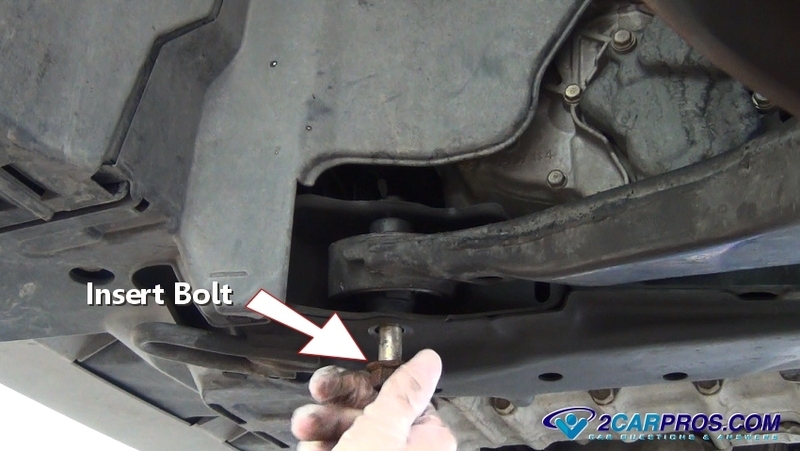 A universal socket and extension can really help when tightening the control arm bolts. 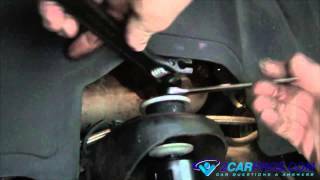 Tighten the lower ball joint castle nut while aligning the cotter pin holes. Once the nut is tight insert the cotter pin. This pin is used to keep the nut in place as a safety precaution. Hold the sway bar link in place while tightening the nut with the wrench or socket and you are all set. Reinstall the wheel and lower the car off of the jack stands. It is highly advised to have the car aligned. When first driving the car listen for strange noises which are a sign the job will need to be rechecked. If you have any lower control arm questions, please visit our forum. If you need car repair advice, please ask our community of mechanics is happy to help you and it is always 100% free.